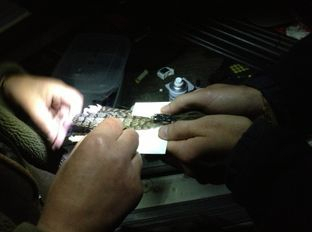 There have been many studies of nightjars and their movements, both locally and internationally. More information about the experiments taking place and the methods used to track birds can be seen in the Science Zone. The information in the graphic comes from the study that took place in 2011 and 2012 carried out by the British Trust for Ornithology (BTO) based in Thetford. The seasonal movement of animals and birds from one place to another. Find a map that shows the international boundaries of Europe and Africa and the names of the various countries - print it out on one or two sheets of A4. 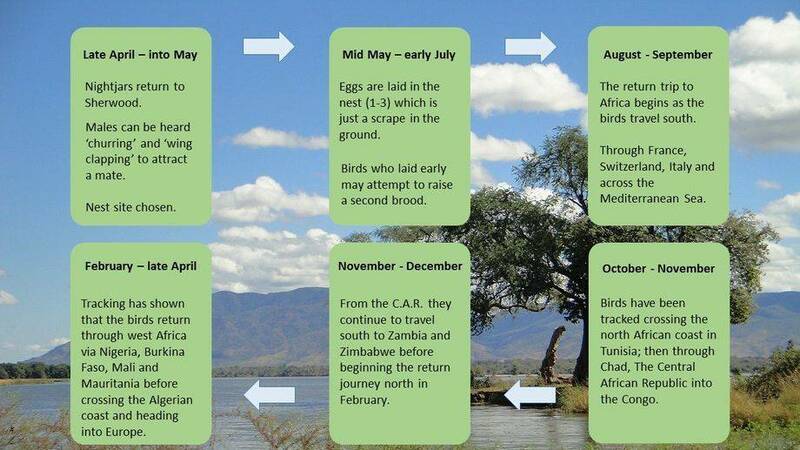 Mark the whole route taken by the nightjar over the year. Now use a code to mark the sections of the route where the nightjar is moving quickly and those sections of the journey where it seems to be taking its time. Which habitats does the bird travel through quickly, and which habitats does the bird linger in? What are your theories about this? The estimated distance travelled by the nightjar is 17,000 km – find out how accurate that estimate is – what’s your answer? Think about this question - it has exercised the minds of ornithologists over the years and see if you can come up with some suggested answers. Why does a bird, weighing only 60-70 g, approx make such a huge journey to breed in Sherwood rather than staying where the climate is warmer? Each member of your group should come up with as many suggestions as possible and write them down on a large piece of paper. What would be your agreed answer(s)? What other birds of similar size make similarly long migratory journeys?